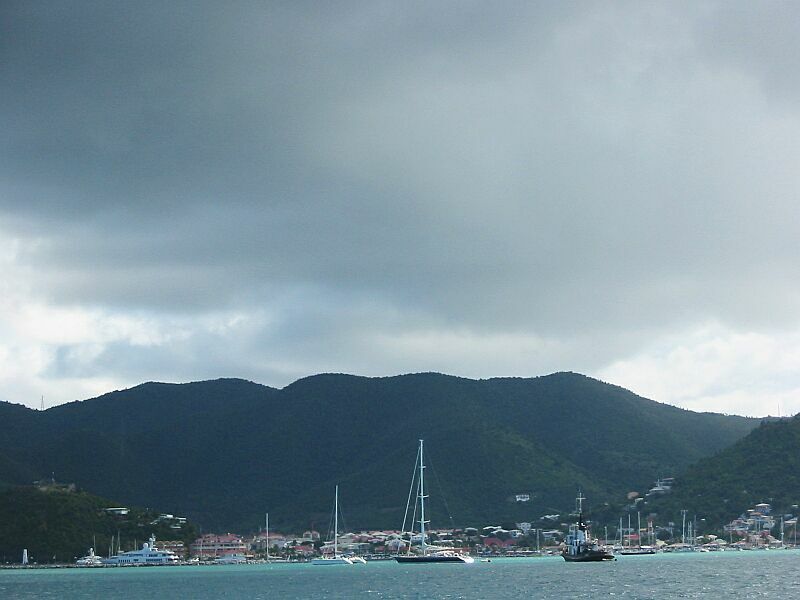 After our stay in Anguilla we sailed over to Marigot, Saint Martin just 8 nautical miles from Anguilla. Marigot is the port of entry of the French side of Saint Martin. Customs in Marigot was the easiest we've seen yet. Here are some pictures from the harbour. Marigot is very French/European in appearance once you go ashore. The steadfast attitude of the French means most of the signs and literature are only available in French. Very different from Sint Maarten where we felt perfectly at home. But, it does give one a feeling of a different culture and most everyone speaks English as well as French, so we had no real difficulty communicating. We stayed one day in Marigot, and then took PatiCat around the north side to Tintemarre - an island off the North East side of St. Martin. Tintemarre is a beautiful rocky island with a fabulous beach. It was a Sunday, so the anchorage became really crowded. Not so much when we got there at 9:30 AM, but later in the day. 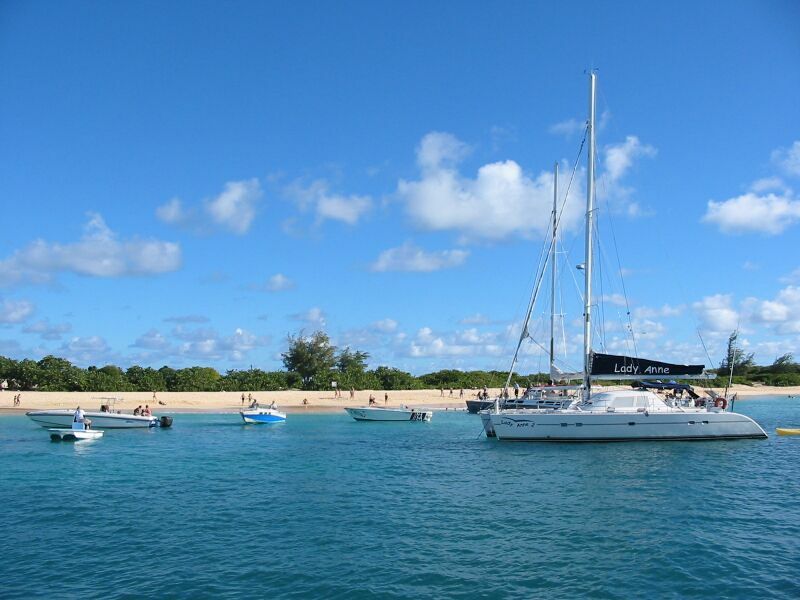 Here are some pictures of the bay and beach where we anchored in the afternoon when the boats were plentiful. 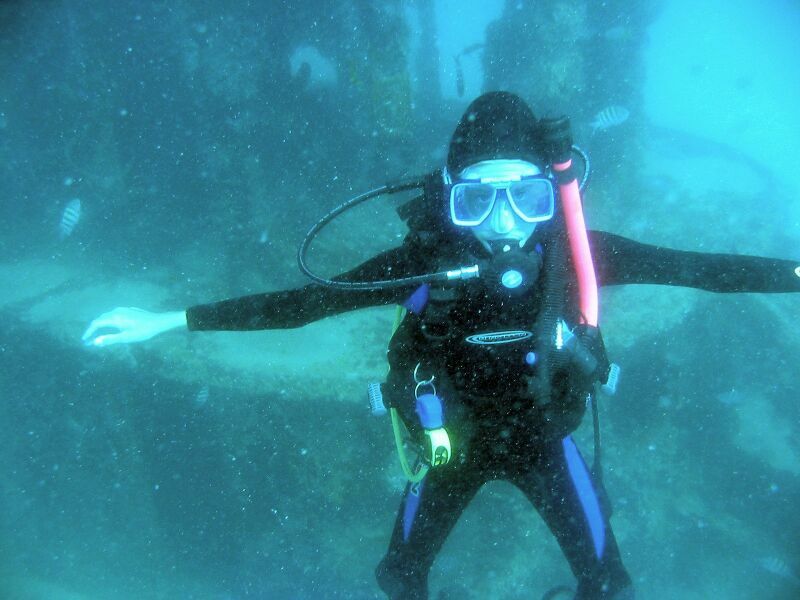 We went to Tintemarre primarily to do a dive site nearby which is a small tugboat in 50 feet of water. 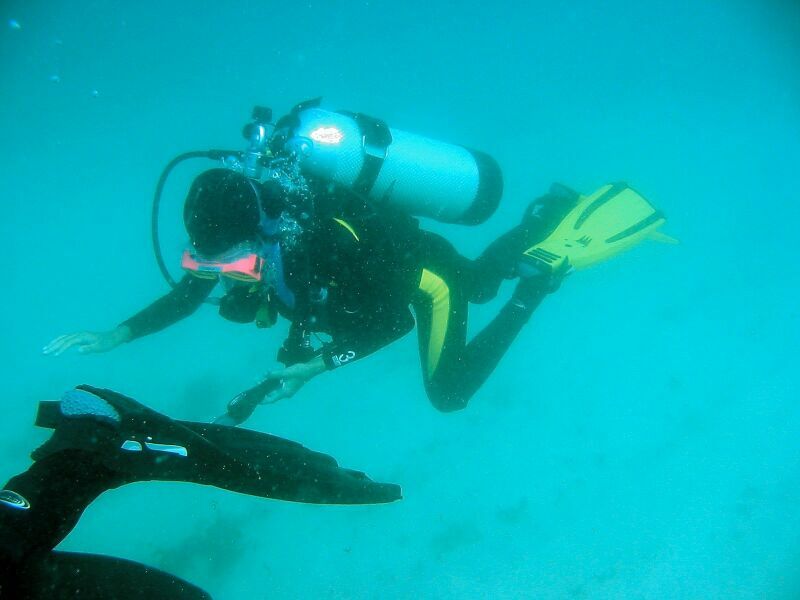 It was a bit difficult to find the dive site as the mooring ball was gone. But, with some directions from a book, and with Frank being pulled behind the dinghy with mask and snorkel, we only took about 20 minutes to find the wreck. Here are the pictures of the wreck. 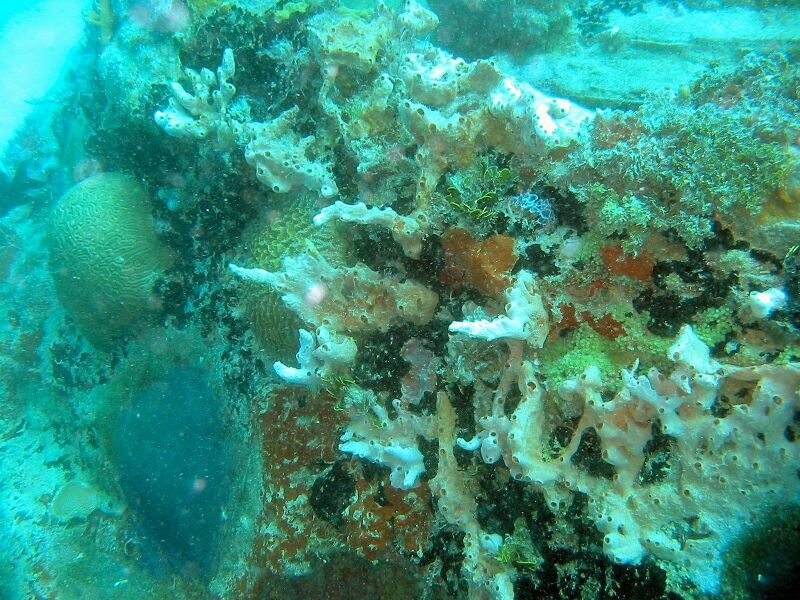 Notice the beautiful encrustations of coral have formed after this wreck has only been in the water for about 10 years. The pictures are of Catherine, Patricia and Karen in that order. Our trip to Tintemarre was just a day trip. So we weren't able to visit the beach. We went back to Marigot late in the afternoon the same day. We wanted to be in Marigot on Monday to run errands when the stores were open. We still had some trouble because everyone was on relaxed hours due to the holidays (with New Years coming on Wednesday). 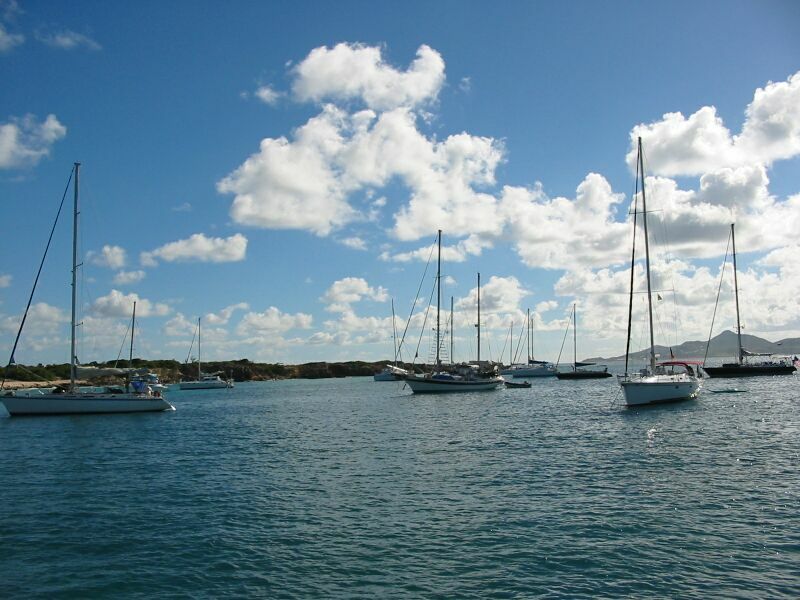 This was when we updated the web site with pictures for Sint Maarten and Anguilla. We also got some provisions and fueled up the dinghy and PatiCat. On Tuesday - New Year's Eve day - we sailed with Hotel California back over to Tintemarre to go to the beautiful beach. When we arrived it was beautiful with only three other boats. The only problem being a few swells in the anchorage due to increased winds. We got on the beach and were just settling in to enjoy some swimming when two large catamarans full of people arrived to do some snorkeling and swimming. 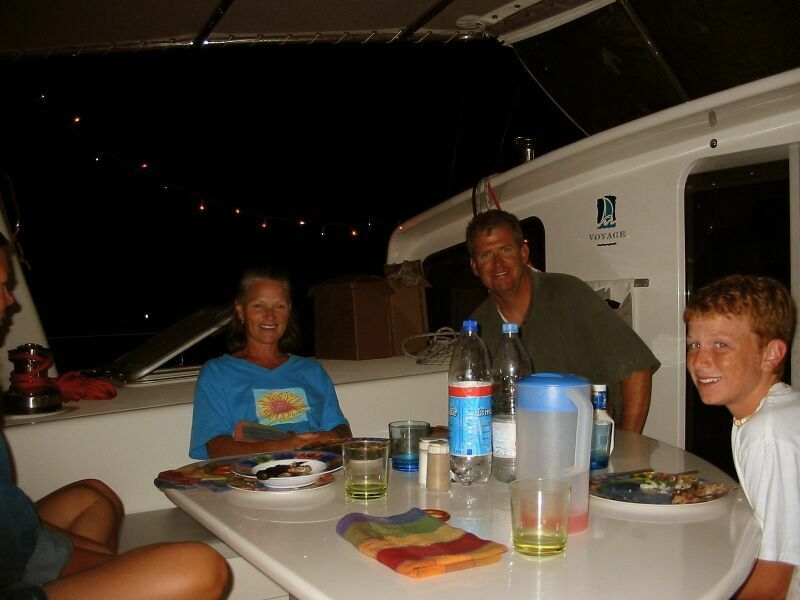 As a result, we decided to just stay and spend the night since the catamarans would only stay a short while. We invited the folks from Hotel California to come to PatiCat for a BBQ dinner and to celebrate the New Year - only we would celebrate it on Universal Coordinated Time (the time used by Mariners) which just happened to be at 8:00 PM local time. We cruisers get to bed early you know! :-) We opened a bottle of sparkling apple cider and everyone had a toast and Frank blew the air horn a few toots. Here are some pictures of the party. During the night at Tintemaare, the winds picked up some more and it got quite swelly. 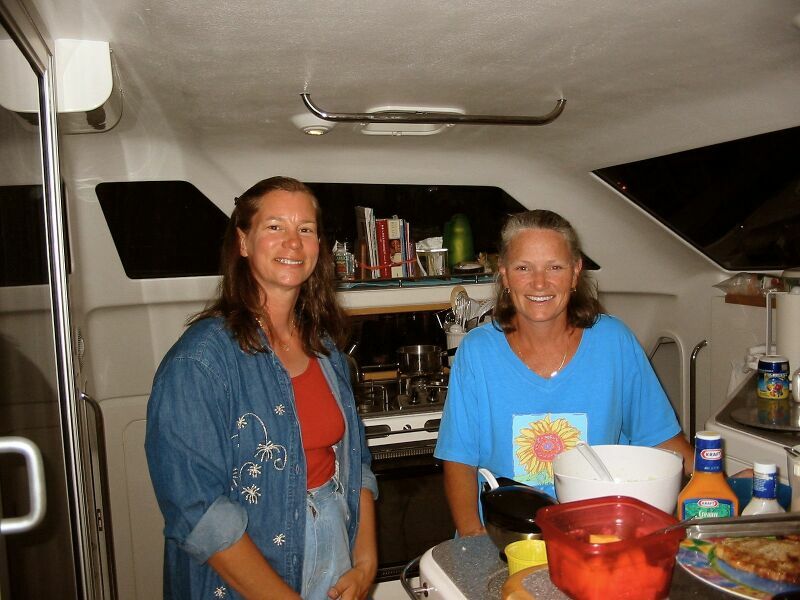 Thank goodness we live on a catamaran. The monohulls which stayed the night were swaying back and forth 45 degrees or more. We just rocked back and forth and had a good sleep for the most part. Although, rain showers came through a few times as well. The next morning we left Tintemarre and sailed back around the north side of St. Martin planning to go to a small beautiful bay we had seen called Anse Marcel. Unfortunately, once we got there we found the swells and choppy waves from the winds were making it pretty rolly in this beautiful bay. PatiCat dropped anchor and was holding fine, but Hotel California was having a hard time. We spent a few hours and the kids went to the beach while the parents went ashore to see if the shopping was any good (it wasn't). Hotel California had some more anchoring problems, so we decided to leave late in the day and go to a calmer bay. As we were leaving, we had a problem ourselves this time with a jammed anchor chain in the windlass. But, a little brute force and a hammer solved it. 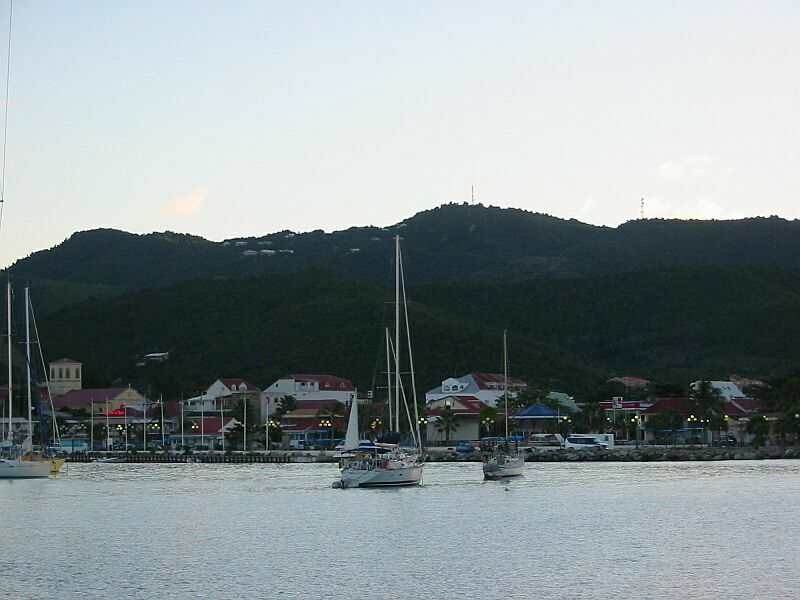 We arrived in Grand Case, St. Martin in dark conditions just after sunset. We found a reasonable spot and managed to anchor solid. Again, Hotel California had some problems, but eventually got set. 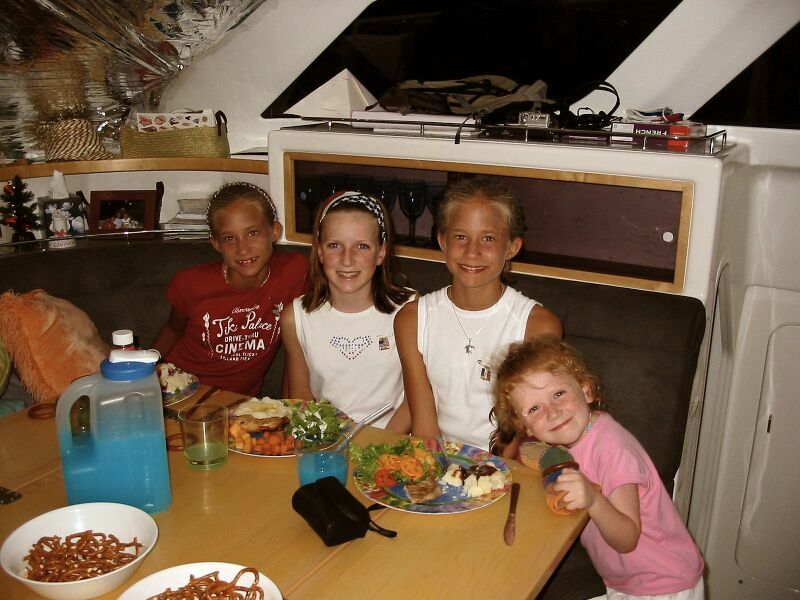 We invited Lindsey (the older daughter) to sleep over for the night and the girls had a good time. The next day, January 2nd, we went ashore and did some shopping. Visited a nice French bakery for some pastries, grocery shopped, and stopped for some ice cream on the way back. We found a book shop, but nearly everything was in French. Disappointing for those of us short on new books to read. We returned to Marigot on January 3rd and did some re-provisioning and ran a bunch of errands (things like getting rid of trash, buying boat maintenance items, fueling the dinghy, etc.). 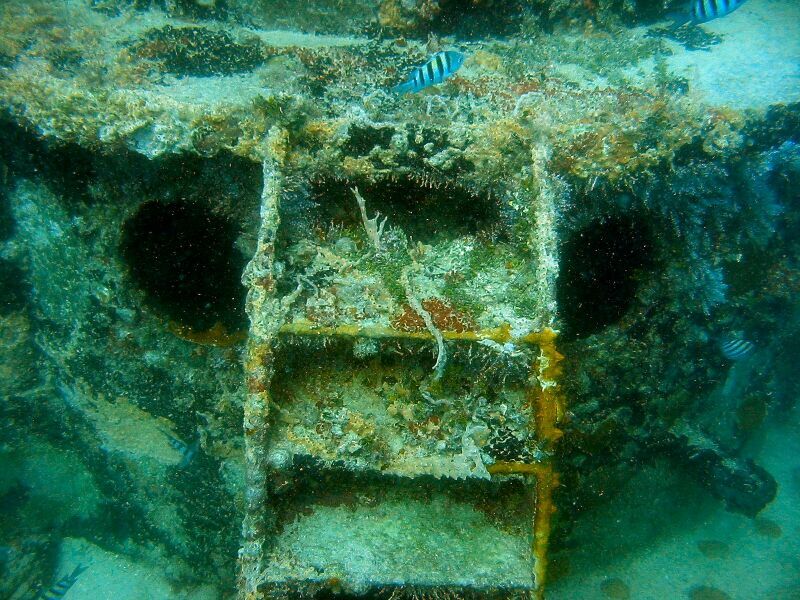 We got on the Internet and did some web page updates including the underwater photos from our first dives. We cleared out of customs that evening for a morning departure. 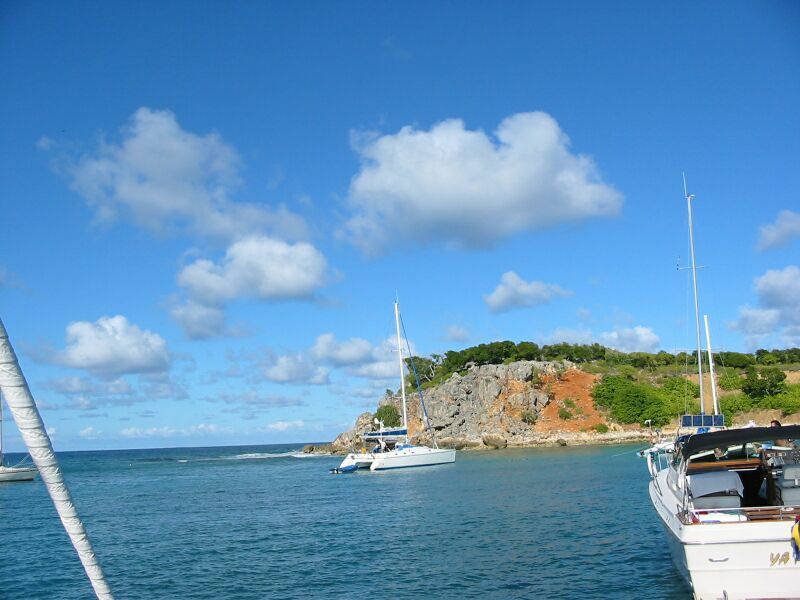 On January 4th, we departed Marigot and St. Martin and sailed towards St. Barts. It was about 25 miles from Marigot to Gustavia, St. Barts. However, we had winds from the SE so, we pretty much had wind on the nose. A few tacks later, it turned out to be about 35 miles total. 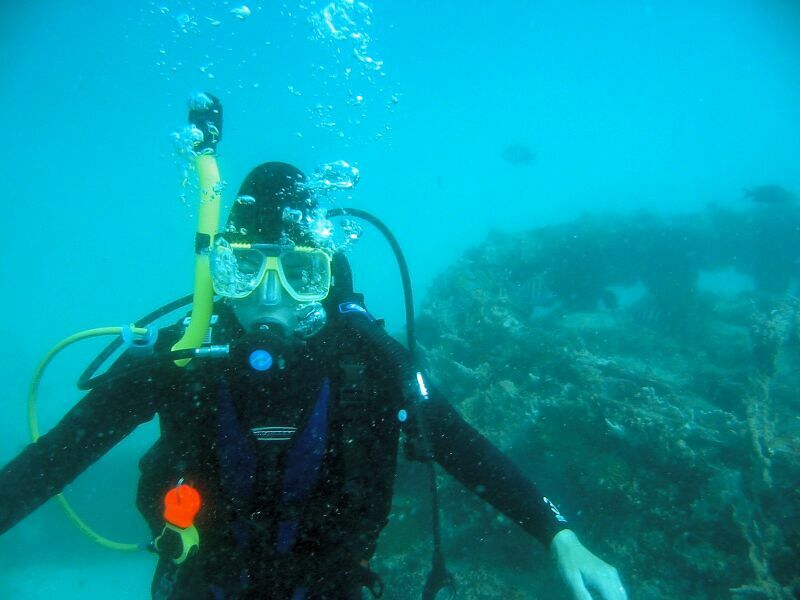 We had pretty rough conditions, and Catherine got sick. Several of the folks on Hotel California got sick as well. Not a fun ride really, although Frank always enjoys sailing.